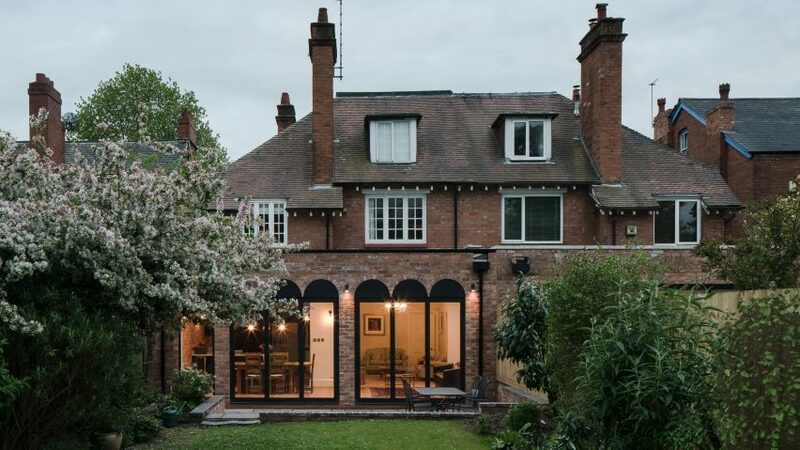 Glass doors are set into arched frames resembling a colonnade in this extension to a Victorian-era house in Birmingham, England, which Intervention Architecture designed for a choir singer. 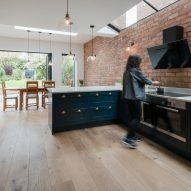 Local studio Intervention Architecture was asked to update the house in the suburb of Moseley to provide the singer's family with an open-plan living, kitchen and dining room in an extension that references the heritage of the original property. Previously, the Choir Singer's House featured a small single-storey extension that offered little dining space and natural light. The architects demolished this and a side wall to build the new brick extension across the full width of the site. The old rear wall was also removed to open the existing lounge to the new space. A row of mono-pitched skylight slots between this boundary wall and the original house to bring natural light into the kitchen, while the dining and lounge are topped by a pair of rooflights. "The previous forms were prohibiting use of the space and also providing limited access to natural light," studio founder Anna Parker told Dezeen. "The new extension area creates a greater access to light through top roof lanterns and mono-pitched side roof lights, to maximise the north light entering the main space." Two sets of glazed bi-folding doors are placed along the rear wall, where they open onto the garden. From the outside, these doorways are segmented by seven black aluminium arches indented into the brickwork. This detail is intended as a twist on ornamentation used in the Victorian era. "The rear elevation references the classical form of colonnade, as well as internal arches found in the original house, which create multiple points of entry with recessed material surfaces, along an otherwise straight-ended elevation," said Parker. In the kitchen, an existing arch that forms part of the chimney hearth is fitted with an additional counter area. 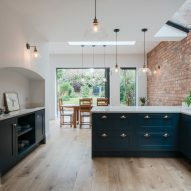 White-painted walls and oak flooring complement the new exposed brick wall, which runs the length of the original house and the rear extension. 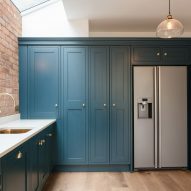 The doors of the kitchen cabinets are painted a deep matt blue to offer a contrast to the light marble worktop as well as the bass sink, tap and door handles. "A white marble worktop was chosen to enhance and reflect light with a fleck of detail and natural interest," said the architect. "Brass pull handles were selected in co-ordination with a brass tap and countersunk brass sink, which allow for highlighting elements to glow amongst the light surface." Outside, a low wall and steps provide a link between the outdoor patio and the slightly elevated lawn. The patio is covered with blue-tinged limestone, while the red-brick wall matches the construction of the extension. Intervention Architecture was founded in by Anna Parker in Birmingham and has carried out projects that the transformation of a tiny Victorian coach house into writer's home and studio.